A pasture feed wedge gives a visual picture of the current pasture situation by ranking the paddocks based on average pasture cover. By adding a target line, it becomes a simple but effective tool to make pro-active decisions. As farms become larger and systems more varied, the challenge is to make pasture management decisions easier, accurate, and less stressful. The answer for many farms will be the implementation and use of the pasture feed wedge. Why use a feed wedge? 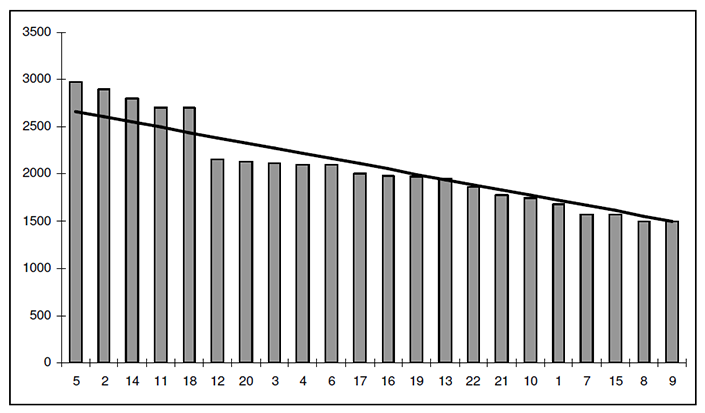 Plotting a feed wedge weekly is essential if you want to achieve high pasture utilisation on your farm. A feed wedge is most useful when the round length is not changing i.e. from balance date through to the autumn. At other times of the season when rotation length is changing, the feed wedge is best used with other pasture management tools. make timely pasture management decisions. What is a feed wedge? 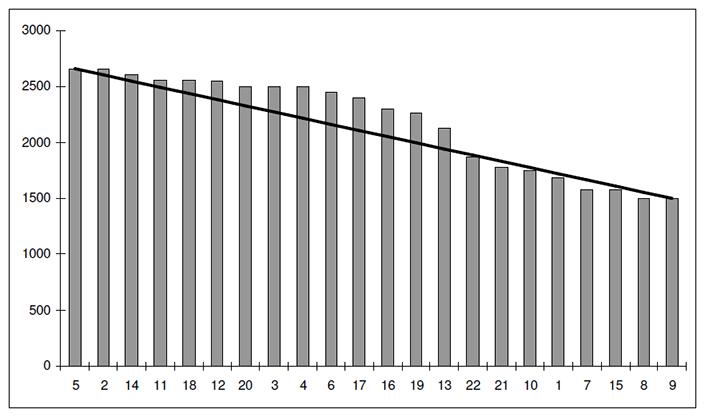 A feed wedge is a graph of paddock covers (kg DM/ha) (y axis) and paddock descriptors (x axis) for a dairy farm for a selected day, sorted by paddock from longest to shortest pasture cover. The line drawn on the graph from longest to shortest paddocks, along with the graph axes resembles a wedge shape, hence the name. 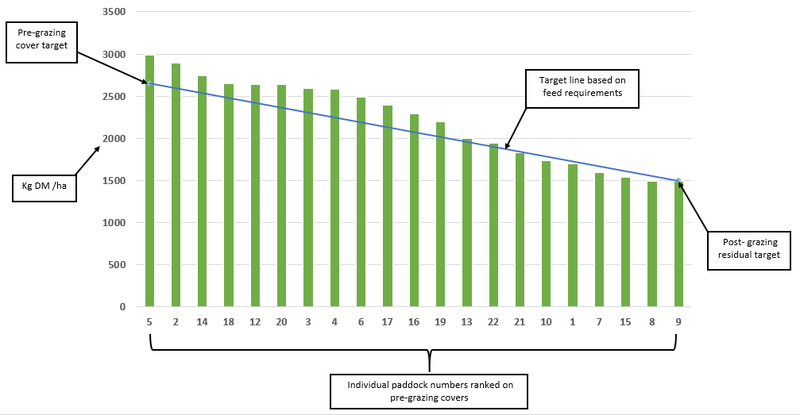 If target pre- and post-grazing covers are placed on the graph at the highest and lowest paddock covers and connected by a target line, it is easy to see which paddocks have a surplus or deficit of pasture. What do feed wedges tell us? How many paddocks would you take out? The farm is in a surplus with pre-grazing cover targets higher than required. The farm is still hitting desired post-grazing residual. The farm has the option to take out paddocks for surplus. What option would you think is the most logical? The next five paddocks are above the pre-grazing cover target line, then the following group of paddocks are below target line. Take out surplus paddocks (harvest or treat as deferred) to restore grazing residual targets. Slow the rotation to meet the post-grazing residual target and give the paddocks below the line more time to reach the pre-grazing target. Are you in surplus situation and would you book in the silage contactor? Next paddock five is at the pre-grazing target. The farm is hitting its post-grazing residual target. There is a group of paddocks in the middle of the wedge that are above the target line. For step-by-step instructions on how to construct a feed wedge and add a target line see the Feed Wedges Farmfact. 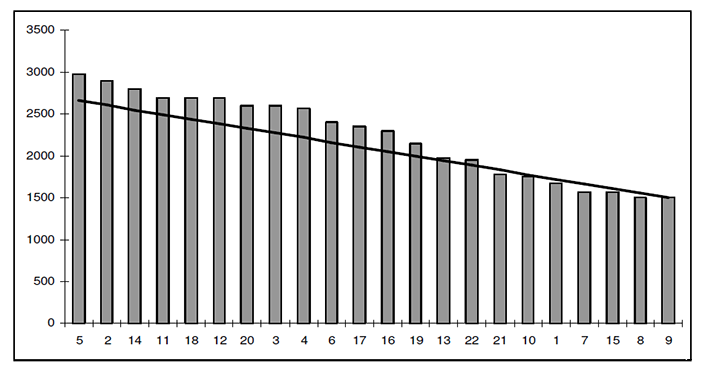 Once the cover is assessed in each paddock, the paddocks can be ranked from longest to shortest in a table. This can be done manually using a pen and paper or using computer software providers. If you are constructing a feed wedge manually the Feed Wedge Ready Reckoner can help. For a list of programs that offer feed wedges see the Pasture assessment page.